A story that started out as one book -- Harry Potter and the Philosopher's Stone -- has grown larger than anyone could ever imagine. From a book series of seven installments, to eight movies adapting those books, a theme park, a play, and now the Fantastic Beasts films, it has become its own unique world, known to many as the Potterverse. The Potterverse consists of all the aforementioned books, movies, theme parks, plays, and more. Part of what makes it all so compelling is knowing that it's part of a single continuity in the same universe. Even though the Fantastic Beasts films take place long before Harry's story begins, fans know that the movies have significant connections to the original series. Within a fandom as enthusiastic and active as this one is, many talented fans have created stunning pieces of fan art. DeviantArt in particular has allowed more and more of such impressive art to be made and shared online, where it can be appreciated by individuals all over the world. Some of the art celebrates fan-favorite characters, depicted very closely to their stories in the books and movies. Another side of fan art is how it dares to show characters in a different light than the books and movies. Many talented artists have created redesigns that illustrate familiar Potterverse characters as part of unexpected romantic couples. Some of these pairings theoretically make sense based on the character's personalities and stories. Others are rather implausible, but that doesn't diminish the impressive creative work rendered by the fans. The couples featured in these redesigns are from both the original Harry Potter series and from the Fantastic Beasts movies. Take a swig of the powerful love potion Amortentia as we explore these 20 Wild Fan Redesigns Of Unexpected Potterverse Couples. Credence Barebone and Newt Scamander might seem like a strange couple, but it could actually work based on what audiences saw in Fantastic Beasts And Where To Find Them. The Muggle family that raised Credence abused him. Gellert Grindelwald tried to exploit Credence and the Obscurus that developed within him. MACUSA sought to destroy Credence as he lost control and reigned havoc on the magical and non-magical world. Newt was one of the few who tried to reach out to Credence and help him. Newt's study of Obscurials helped him understand Credence's condition. Credence would greatly benefit from a partner who is as compassionate and understanding as Newt. BladeDeeHunter's fan art captures that with Newt extending a flower to Credence. Draco's face is probably still throbbing from Hermione's punch in Harry Potter and the Prisoner of Azkaban. Despite their differences, though, Linndsey's redesign makes a compelling case for them as a couple. They're both confident, yet struggling with their own ongoing insecurities. They are proud and ambitious, with others constantly looking to them. Even with these connections, it would still be difficult to make "Dramione" work, especially in their Hogwarts days. Draco quite simply was too prejudiced and arrogant. Post-Deathly Hallows, when Draco was far more mature and striving to be a better person, his maturity would've caught up to Hermione's and them as a couple seems more plausible. The life of a house-elf is a difficult one in the Potterverse. Winky had particularly challenging circumstances since she had to keep the secrets of the Crouch family. Later, when Winky joined the Hogwarts kitchens, Dobby did his best to help Winky assimilate to her new life. Whether it's as a romantic couple or just fellow house-elves helping each other out, Dobby and Winky are definitely an underrated pairing. It certainly didn't help that Dobby only ended up being in the Chamber of Secrets and Deathly Hallows: Part 1 movies, while Winky was cut out from the movies entirely. ShovelDuct does their best to rectify this with Dobby and Winky at the forefront of this peaceful, loving redesign. It's also refreshing in that it focuses on pairing non-human characters. In the books, Ginny Weasley was a popular and charismatic individual, well liked among a variety of Hogwarts social circles. Luna Lovegood's eccentricities led many of her peers to think she was strange. As such, their peers weren't exactly going out of their way to become friends with Luna, while many wanted to be connected to Ginny. Regardless of these social differences, Ginny was generally friendly with Luna and enjoyed spending time with her. Ginny seemed to appreciate Luna's quirkiness, which likely was grounded in the fact that she knew Luna was a more authentic person than many of their peers. Luna seemed to appreciate Ginny just as much for accepting her and choosing to spend time with her when Ginny easily could've chosen a different crowd. This kind of past relationship and appreciation for one another allows a Ginny-Luna dynamic to make sense as shown in tasiams' redesign. As close as James Potter and Sirius Black were, Sirius and Remus Lupin were very close as well. In order to help his friend every month when he'd transform into a werewolf during the full moon, Sirius learned to be an Animagus so he could somewhat safely interact with Lupin and be there for him. Considering the elitist and prejudiced background of the Black family, Sirius easily could've shunned Lupin for being a werewolf. Instead, though, Sirius defied his own family and supported Lupin every step of the way. It was beautiful in Prisoner of Azkaban and Order of the Phoenix to see Sirius and Lupin reconnecting as adults, finally aware of the truth concerning the demises of James and Lily Potter. This redesign by irishgirl982 goes back to the character's younger days at Hogwarts, their close friendship growing into something deeper as they return from a Hogsmeade trip and visit to Zonko's Joke Shop. While there was never much hint of a love connection between Severus Snape and Narcissa Malfoy, they have somewhat similar arcs. Both were Slytherins and grew up believing in a pure-blood ideology. They served Voldemort loyally for a while until they changed sides in order to protect those they loved. Snape became Albus Dumbledore's man once he learned Voldemort was going to target Lily Potter. Narcissa Malfoy lied to Voldemort's face in order to save her son Draco. Both Narcissa and Snape were protective of Draco, caring more about saving his soul and shielding him from taking a life than fulfilling the wishes of Voldemort. Lily was the only woman Snape loved and no one could ever replace her. That being said, there is undeniable connection between Narcissa and Snape, a kind of solace despite difficult circumstances and understanding between them that is embodied in madcarrot's redesign. The Fantastic Beasts movies have pitted Newt Scamander and Gellert Grindelwald against one another. Even in his disguise as Percival Graves, Grindelwald never really connected with Newt. In fact, he tried to use his position in MACUSA to eliminate Newt as soon as possible. 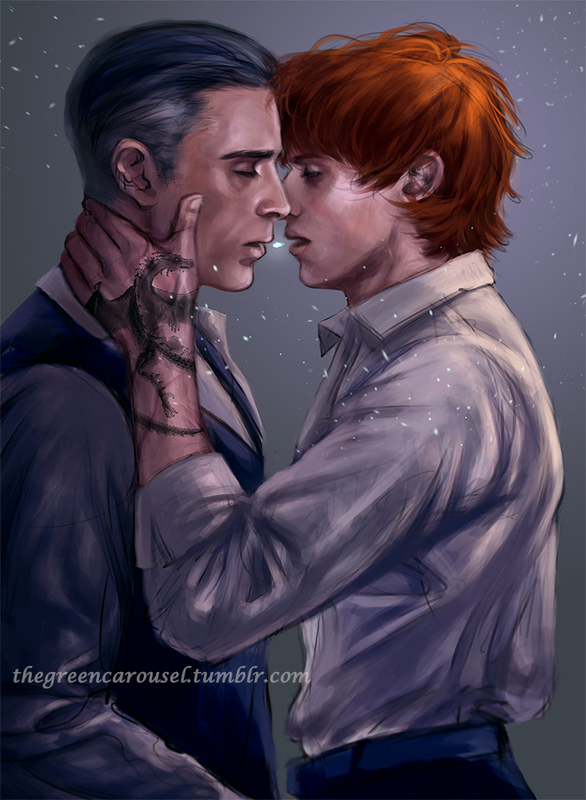 All of these factors make it refreshing to see thegreencarousel's redesign of the primary protagonist and antagonist of the Fantastic Beasts movies as a romantic couple. Newt has a dragon tattoo here, making him seem a little less of magizoologist nerd and a little more edgy -- but still an admirer of magical creatures -- and probably more to Grindelwald's liking. In his younger days, Grindelwald could've been this tender with Albus Dumbledore, but he's too far gone into the depths of evil by the time he met Newt. Some fans felt the Remus Lupin-Nymphadora Tonks relationship came out of nowhere. They argued that there wasn't enough shared scenes and chemistry beforehand to make their romantic status suddenly seem plausible. PastelNinja's redesign fixes this by having Tonks in a relationship with a different Order of the Phoenix member, Kingsley Shacklebolt. As Aurors working at the Ministry while secretly being heavily involved with the Order, Tonks and Kingsley arguably have a lot more in common than she and Lupin did. Tonks and Kingsley could also balance each other out nicely in terms of personality. Tonks is more quirky and outgoing, while Kingsley is more calm and reserved. They're nice people but they aren't afraid to fight for what they believe in and will do everything in their power to stand up for others. There's a perfect amount of connection mixed with distinct differences that would make them work well as a couple. Yamatoking's fan art shows a familiar moment between Harry and Hermione in The Half-Blood Prince. Harry comforted Hermione after she saw Ron with Lavender Brown. It also captures how Harry and Hermione look natural together as a couple. Many romantic relationships begin as close friendships, eventually going to the next level. This would make a lot of sense with Harry and Hermione, especially since they have a lot more in common than Ron and Hermione. There's a deep sense of understanding and compassion between them. Even J.K. Rowling admitted that Harry and Hermione would've made a good couple and that it was ultimately a mistake to put her and Ron together. Helga Hufflepuff and Salazar Slytherin had entirely different philosophies about which young wizards and witches should be able to attend Hogwarts. Slytherin believed that those of pure-blood ancestry should be accepted into Hogwarts. He asserted that under no circumstances could Muggle-born students be accepted. On the other hand, Helga Hufflepuff was open to a wide variety of young witches and wizards entering Hogwarts and she treated them all equally. Slytherin's philosophy was based on superiority and Hufflepuff's philosophy was based on compassion. One was incredibly narrow-minded and elitist, while the other was open-minded and accepting of diversity. They are the most unlikely pairing out of all the Hogwarts founders, yet nami64 shows attraction brewing between them. Not surprisingly, Helga is more open in her affection here than Salazar, but the connection is definitely forming between both of them, unexpected as it may be. It's weird to see Hermione romantically involved with a Weasley who isn't Ron. Fred generally seemed to respect Hermione and she respected him, even if it was with a mix of exasperation and amusement towards his antics. There was never any hint of attraction between the two characters, though. Yet, there's something undeniably appealing about Natello's depiction of Hermione and Fred as a couple. It's not so much that they'd be good for one another. Instead, it's more that the artist creates such a warm, homey feel. Sitting by the fire, with Crookshanks curled up in Hermione's lap, and the ease of the two being in one another's company feels right. It's more to do with the scene created by the artist than how they would actually operate as a couple. Noodlerface's fan art of Harry and Draco as a couple is soft and sweet. It's cute seeing Draco resting his head in Harry's lap as Harry strokes his hair. Given their relationship during their years at Hogwarts, it's pretty much impossible to think about Harry and Draco as a couple. By the time they're adults and have kids of their own in Harry Potter and the Cursed Child, it could be a different story. The play demonstrates how far Draco's maturity and worldview has come. As fathers struggling to protect their children from being negatively affected and overshadowed by family legacy and rumors, Harry and Draco experience a shared challenge. This, plus the quest to save their sons, puts them together like never before, even if it's not quite couple status. It's still fun to imagine them as a couple in their younger days, though. It came as a surprise to many fans that Neville Longbottom and Luna Lovegood didn't end up together. Both characters were loyal, compassionate, brave, yet they often struggled to fit in. Dumbledore's Army was so meaningful to them not just because it gave them a way to stand up to Dolores Umbridge and make them feel more in control of their lives, but also because it gave Neville and Luna a sense of belonging. This is why a year after Dumbledore's Army last met, Neville and Luna were the only ones who still held onto their Dumbledore's Army coins and checked them regularly. The way they're looking at one another in AniPokie's redesign is adorable, as is the fact they exchanged scarfs. As much as we support Neville's marriage to Hannah Abbot and Luna's marriage to Rolf Scamander, we can't help but wish in moments like this that Neville and Luna ended up together. Prior to the release of Fantastic Beasts: The Crimes of Grindelwald, little was known for sure about the past relationship between Newt Scamander and Leta Lestrange. Instead of a dramatic falling out like many presumed, Inimeitiel takes a more innocent and sweet approach in depicting them as a couple. Still rather young Hogwarts students at this point, Newt and Leta hold hands while they both smile adorably. With very different beliefs and attitudes, Slytherins and Hufflepuffs often don't fraternize. That certainly isn't the case here, though, as Leta and Newt break barriers and are proudly together. Though we discover that Leta did have feelings for Newt in Crimes of Grindelwald, it's still a bit heartbreaking to see this redesign knowing that Leta became engaged to Newt's brother Theseus Scamander and considering her ultimate fate in the film. Sirius Black and James Potter were immediately the best of friends from the moment they met. Their bond continued even after they graduated from Hogwarts. As fellow Order of the Phoenix members, they dared to stand against Voldemort and his Death Eaters when most other shied away from the fight. James even named Sirius as the godfather of his son Harry. Everyone knew Sirius and James were best friends. Because of this assumption, everyone figured that Sirius had been the Potters' Secret Keeper and had been the one to betray them to Voldemort. It turned out the Potters had been counting on this assumption, though, and instead made their Secret Keeper Peter Pettigrew. Viria's fan art shows them still in their Hogwarts days, connecting over their shared mischievous, somewhat arrogant natures. Their enthusiastic friendship beginning to transform into a passionate romantic relationship. It's not really shown in the movies, but book readers know Parvati Patil and Lavender Brown are the best of friends. They were largely inseparable and spent much of their time together. They shared a room during all of their years at Hogwarts. Together, they reveled in the glory of Divination and greatly admired Professor Trelawney. With all of these factors in mind, it's not unreasonable to think of Parvati and Lavender's friendship turning romantic. Their close bond over the years created a foundation for them as a couple, as opposed to the Lavender-Ron Weasley couple, which had very little buildup in previous books. Meabhdeloughry's fan art depicts Lavender and Parvati curled up next to one another, reading tea leaves, and basking in the warmth of candlelight and each other. Daekazu's redesign is so much fun largely because Harry and Pansy are such an unexpected couple. Neither character really has anything in common with the other. Pansy looks a lot sweeter here. She looks nothing like the girl who bullied Hermione and immediately pointed out Harry in the Great Hall so he could be handed over to Voldemort. Pansy's personality would have to change a lot for her to connect on any level with Harry. She would also have a difficult time connecting with Harry since they have such different beliefs and backgrounds. That being said, the colors in the background offer a wonderful visual representation of a dedicated Gryffindor and dedicated Slytherin forgoing the usual boundaries and becoming a romantic couple. They are a highly unlikely Gryffindor-Slytherin match, though. Seamus Finnegan and Dean Thomas were best friends throughout their time at Hogwarts. Dean even traveled to the Quidditch World Cup with Seamus and his mother in Harry Potter and the Goblet of Fire. Dean was unable to return to Hogwarts for his seventh year, as his Muggle-born status would've put him in serious danger with the school under Voldemort's control. When Dean did return at the end of the year for the Battle of Hogwarts, Seamus was overjoyed to see his best friend and ran to hug him. AliWildgoose turned their longtime friendship into romance in honor of Valentine's Day. It seems like the making of a first kiss, both of them eager, yet nervous as their close friendship begins to turn into something much bigger. Perhaps it could come about as a rebound move for Dean after he and Ginny Weasley broke up. It could also happen after Dean and Seamus were separated during their seventh year, finally coming to terms with their feelings for one another. Even though each Hogwarts house is defined by specific characteristics, the individuals within each house can be vastly different from one another. A great example is Cho Chang and Luna Lovegood, two Ravenclaws who offer a stark contrast in personality. Cho is a more traditional popular girl. She was very outgoing and athletic, she was the star of the Ravenclaw Quidditch team, and she dated well-known young wizards like Cedric Diggory and Harry Potter at Hogwarts. Luna, on the other hand, was the farthest thing from a traditional girl. She was eccentric, seen as strange by many, and was more introverted as her social circle generally only consisted of a few close friends. It might seem like a stretch imagining them together, but GEITENKAAS makes it possible with this redesign of the two setting aside their differences and finding a connection. The toxic environment Credence grew up in made him the tortured soul fans met in Fantastic Beasts And Where To Find Them. CaptBexx's detailed fan art illustrates Credence getting the kind of love and support he needs from Queenie Goldstein. Credence and Queenie have some characteristics in common, as both are a bit eccentric and have rare magical abilities. Queenie is a gifted Legilimens, while Credence, against all odds, survived with a powerful Obscurus forming within him. The major difference between them is that Queenie generally uses her ability to help others. By understanding their pain and thoughts, she's able to comfort and provide others with assistance. Years of repressing the magic within him allowed the Obscurus within Credence to fester, eventually exploding into destructive chaos that harmed many individuals. Since we recently saw Queenie turn to the dark side in The Crimes of Grindelwald, this couple seems more likely than ever before. What's your favorite redesign of an unexpected Potterverse couple? Let us know in the comments!